_DK's IMFX does that,not like PS2 though. TTDISA fixes the parachute anim and the missing props on the map. Not sure about the ped paths, but there are a lot of streets and sidewalks that are completely empty from peds. 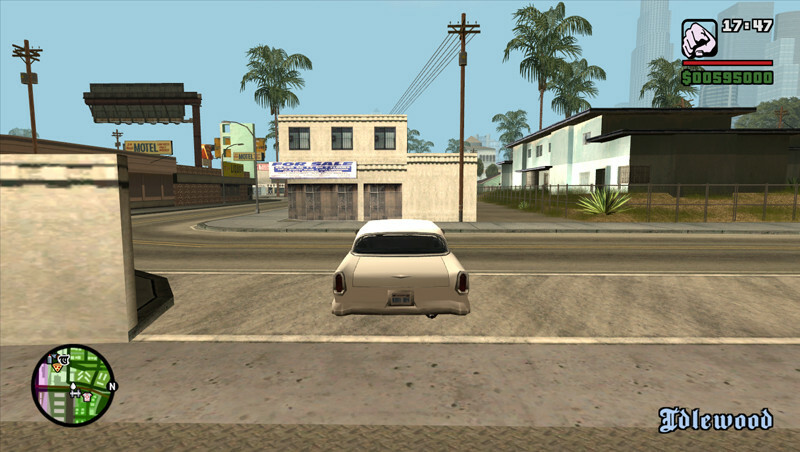 Sun glare effect like GTA 3, Vice City and PS2 SA (I believe it wasn't cut, probably same fate as the sunlight in the PC timecyc that wasn't included for some reason). Lens flare IS working but none of the bloom/glare effect. 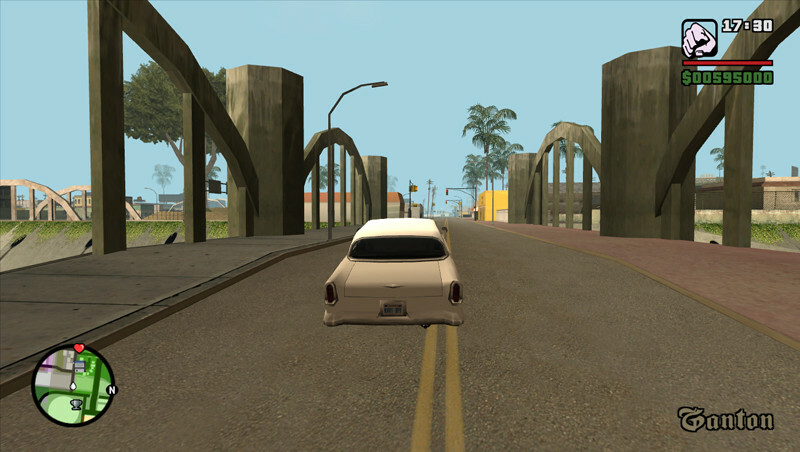 Alpha blending bug (easily seen on the spotlights in the dance club, edges of all the vegetation, freeway sign letters, fences, map decals such as the one on the Ganton gym or the cracks in the road at El Corona, car decals, etc). Not sure if the helicopter rotor fix also fixed this as well? Though, the removal of those original PS2 "reflections" on the cars was probably an intentional decision by R*, and not a bug. The thing is, the cars with the new PC sheen don't respond to most of the lighting anymore, which I believe is a bug and should be fixed. An easy example is the police siren colors. The wheels/peds will flash red and blue colors correctly, but the PC car sheen will remain a static white color. 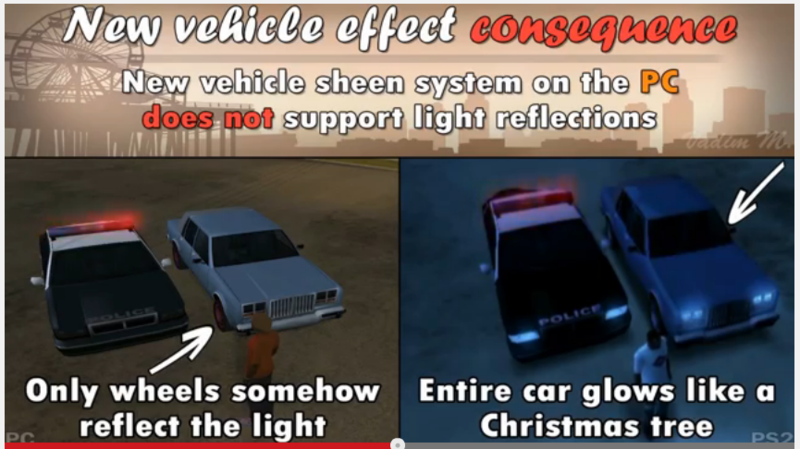 On PS2 the cars responded to that kind of lighting (as seen in the graphics comparison video), instead of just the traffic lights. The orange effect on PS2 I imagine must have been some kind of post-processing or something PS2-specific, not sure how that could get carried over to PC unless you used colormod to mimic it or something. This is probably the biggest bug in every 3D era game, people say it's impossible to fix, but honestly after seeing the work done by some modders here i can't doubt anything. It's not impossible, just very time consuming and nobody feels like taking that time to figure out what the issue is. Not sure if I'm right, but from mobile the bug seems to be partly fixed. It still has some alpha bug remaining. Which I think this bug is something related to model or texture file. DK and Petka managed to mitigate if not outright get rid of that fringing artifact, but yeah, you're right about it being a PITA to remove, hence why people are pretty much complacent with it. And when I was referring to the alpha bug, I meant the one specific to PC SA (I personally haven't seen it in any other 3D era game), or otherwise known as the "fringing" on the edges of alpha textures. There is another alpha bug all 3D era games share, usually when two alpha textures overlap eachother or something like that, but that's not what I meant. and the max resolution I can select is 1680x1050, while my monitor supports 1920x1080. This combined with exdisp.asi to unlock fullHD resolution plugin causes some problems. By default resolution sets back to 1680x1050 and it causes the map to display upside down. Setting it to 1920x1080 solves it, but I have to do it on every game startup, so it's quite uncomfortable. Also after closing the game there is always a dialog informing that game has crashed. The problem is already fixed in VCS PC Edition. I can select fullHD in this window. ^ Use "Widescreen HOR+ Support". Indeed. SILENT, WHERES DA RELIZE? 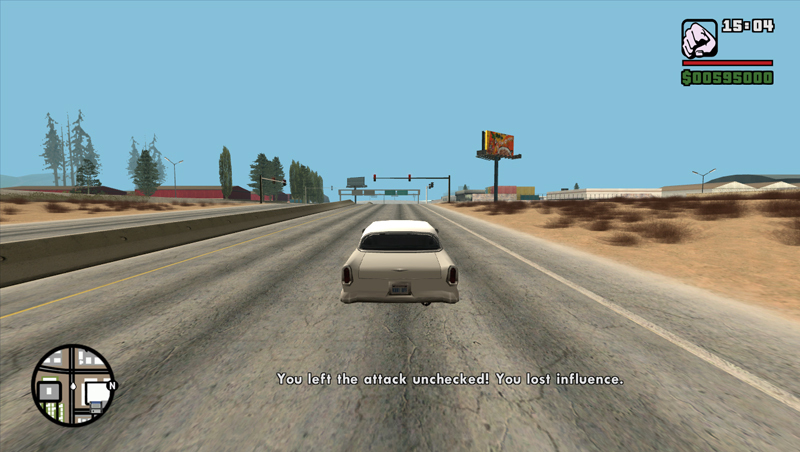 First, I let the Ballas take over my territory in Ganton, so I "lost influence"
It's not a glitched beta leftover, is just how it should be. Maybe your right. I think it doesn't know how to handle the feature when there are modded turfs so it shows the text in that color. Where I can get that mod or edit something to get the colored text? Thanks. Can you post the original link to that video please? I believe my game already has this feature; but want to see the comparison just to be sure. Well I think this reflections on cars by police sirens depends on what timecyc do you have. Original PC timecyc is sh*t, I has missing values like illumination etc. Even PS2 timecyc (provided with pc version - timecycp.dat) is better cause it has those missing values etc. 2) Even if we have disabled radar, that sign (colored font) won't help us to survive just because gangs in SA aren't dangerous. His mod, his decisions. Calm down. I'll probably make it optional AND make this colour blend with the original zone name colour. Call it imagining how R* could have wanted it to work. 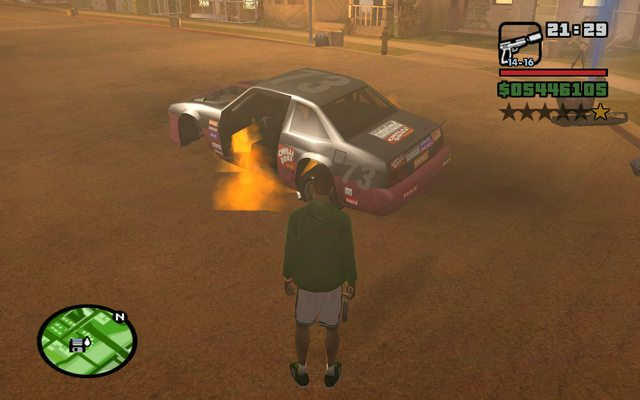 Any chance of bringing some of the fixes from 1.01 like cars being black when destroyed. Cars getting dirty over time. 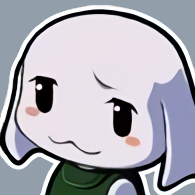 Pretty much things that work in PS2 version. ^^Ha ninja. Yeah that too. If only I knew how it's done. 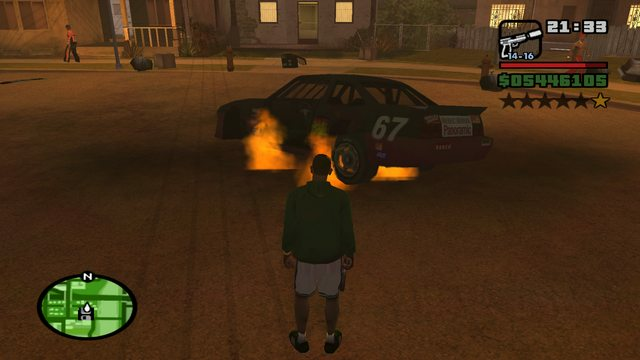 cars being black when destroyed. I never really noticed the difference. Comparision screen maybe? Aren't both of those things fixed in ImVehFt? Technically, you may have already fixed it via a different method. Before the timings never took into account the frame delay meaning players would have to press the input BEFORE it reaches the hitbox. 1.01 may have adjusted the hitbox for these but here, there's no frame delay anymore so the minigame controls should be more accurate and tighter to how they originally were.